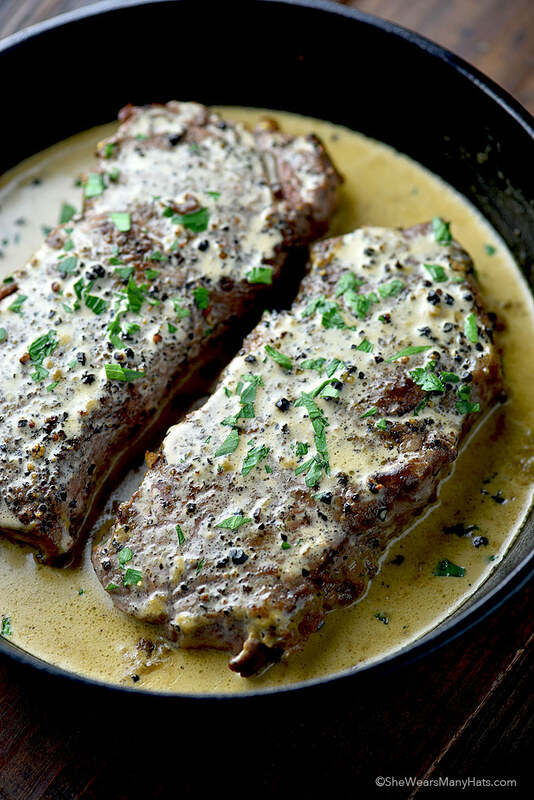 Made with fresh crushed black pepper and a creamy Cognac sauce, Steak au Poivre is not to be missed. It’s absolutely perfect for a special occasion meal. Steak au Poivre is a dish that we’ve enjoyed for many, many years on special occasions. Randy began preparing it for our special Valentine’s Day dinner each year back when our children were young and not so interested in steak. Now they enjoy it just as much as we do. And no wonder—it’s delicious! If you’re a fan of beef, this is an indulgent way to enjoy it, for sure. 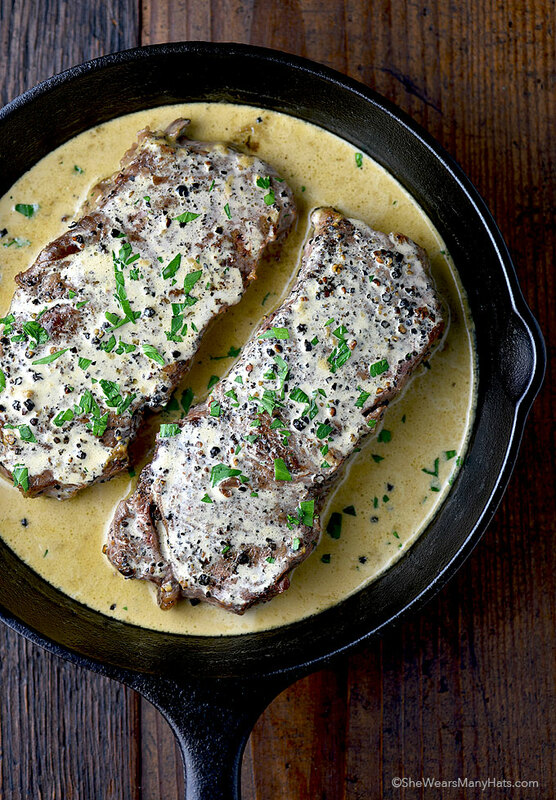 Made with fresh crushed black pepper and a cream sauce, with a bit of Cognac, Steak au Poivre is not to be missed. 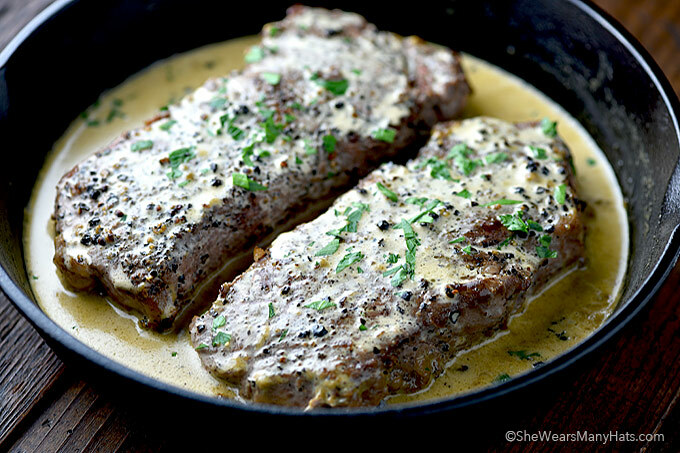 We originally learned of Steak au Poivre through Alton Brown’s Good Eats years ago. The first time we prepared this dish, the aroma was so enticing, before the steak finished cooking we were already planning the next time we were going to make it. Since then Randy has mastered the preparations, and boy, do I feel spoiled. Originally Steak au Poivre was a something we enjoyed couple of times a year on special occasions, but since our children have flown the coop, it often makes a regular Friday night appearance. Steak au Poivre is excellent served with a simple side salad and Garlic Lemon Green Beans, or Roasted Asparagus. The peppery cream sauce over asparagus is out of this world! Or roasted potatoes? Oh my! As I said, Randy has mastered the Steak au Poivre (yay me!) and with a few simple tips, you’ll be mastering Steak au Poivre in no time too. Filet mignon/beef tenderloin is the very best steak to use for Steak au Poivre, as well as thick NY Strips (as shown in the photos in this post). Be sure to trim any excess fat or gristle before cooking. An iron skillet is the perfect pan for cooking the steak and sauce. It creates a fabulous sear, cooks evenly and transfers well from the grill to stove, as needed. We use a mortar and pestle to crush the peppercorns. A heavy flat bottomed glass works well. Of course, if needed a pepper mill set on a large grind would work okay too. Most recipes may recommend a non-alcoholic substitute for the Cognac, but it is not something I recommend for this recipe. Cognac adds so much flavor to round out the pepper and cream. The alcohol cooks out during the cooking process. The sauce is divine! I prefer to cook this dish mostly outside for safety reasons. A side burner on a gas grill works great. As always, when cooking meat, especially steaks a meat thermometer is helpful. The recipe below instructs to cook for 4 minutes, each side for medium rare, based on a 1 1/2-inch thick steak. For preferred doneness, adjust cook times accordingly. When you begin to coat steaks in the crushed pepper, it seems like a lot of pepper. I thought the same thing but the cream balances the pepperiness and both those flavors combined with a good steak and the earthiness of the Cognac, oh my goodness. So don’t skimp on that pepper! 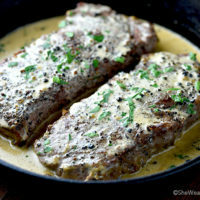 Beef steaks prepared in a skillet and made with fresh crushed black pepper and a creamy Cognac sauce. At least 30 minutes, up to an hour before cooking, remove steaks from the refrigerator. Sprinkle all sides of steaks with salt. Just before cooking, pat steaks with a paper towel to remove any excess moisture. Generously coat all sides of the steaks with the freshly ground black pepper, pressing it into the steaks. Heat a large heavy skillet over medium high heat. Add butter and olive oil. Just as butter begins to smoke, place steaks in pan. For medium rare, cook for approximately 4 minutes on each side. Adjust cook time according to desired doneness, using a meat thermometer to check for doneness. Transfer steaks to plate; cover loosely with foil. Turn burner off. Carefully pour Cognac into hot frying pan. Carefully light the alcohol with a long lighter or match; shake and swirl pan around until the flame burns out. Turn heat back on to medium. Whisk in the cream. Continue whisking and bring to a simmer; continue cooking, stirring/whisking until sauce lightly thickens, about 6-8 minutes. Salt and pepper to taste. Turn off the heat; add steaks back to the pan. Flip to coat all sides with sauce. Serve immediately. Recipe from Alton Brown with ever so slight adaptations. Originally published October 25, 2015. This looks incredible! I know this is something my whole fam would love! Just looking at it makes me hungry 🙂 must try.. 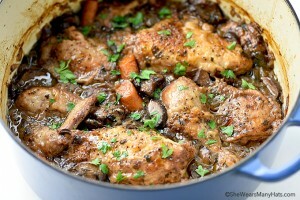 I made this for dinner tonight and it was DIVINE!! My family absolutely loved it!! That looks sooooo good! This would be a good Father’s Day dinner idea! So many people are afraid to use cast iron. It took me a long time to get over that they didn’t need to be scoured to death. Looks like a great recipe for this weekend! What Cognac would be a good recommendation, anyone? What is the garnishment depicted in the photograph please?